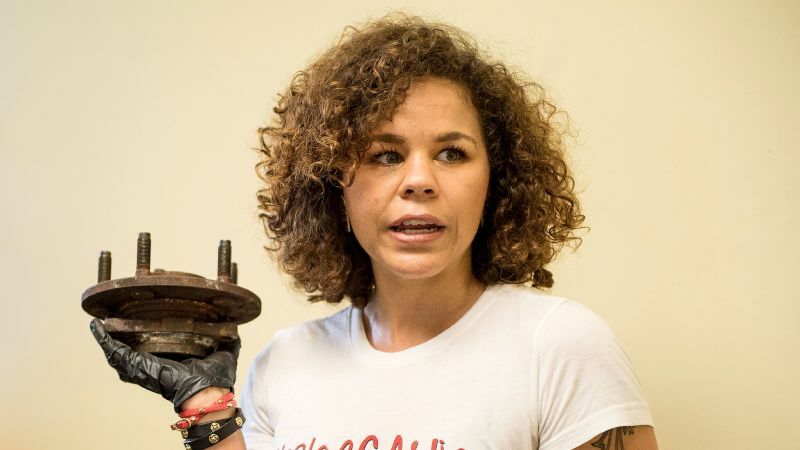 Patrice Banks went from giving free workshops to founding Girls Auto Clinic, an all-women garage in the Philadelphia area. UPPER DARBY, Pa. -- Patrice Banks was running around in black spandex shorts, her wild curls tousled and sporting her signature red boot stilettos. She ran into the garage at Girls Auto Clinic, where three cars were stationed. While one of her mechanics worked under the hood of a car, Banks organized different car parts and tools on a table, prepping for the 12 women who were attending her free monthly car workshop that day. Banks does not embody what most people envision for a typical auto mechanic. 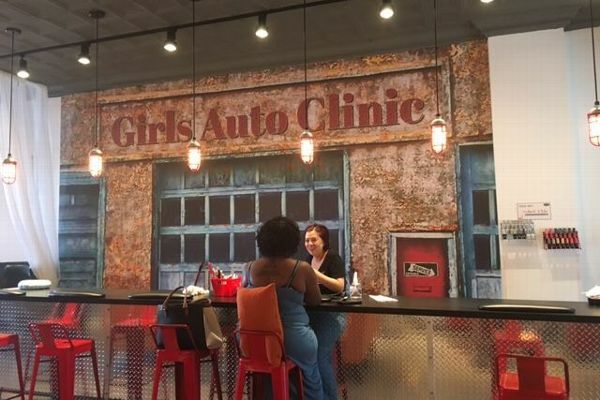 And Girls Auto Clinic, which she founded, is by no means a typical auto repair shop. It offers snacks and coffee like many other shops, but Girls Auto Clinic also features a hair and nail salon called Clutch Beauty Bar. Yes, a salon in an auto clinic. On the day of the workshop, a nail technician worked on a customer's nails as she waited for an oil change, while an older man sat in a pedicure chair and leaned back in a state of euphoria as his feet were being massaged. Clutch Beauty Bar is a hair and nail salon that's part of Girls Auto Clinic repair shop near Philadelphia. A few minutes later, clinic attendees were ushered into the garage, and Banks quickly got to business. She covered the functions of the battery and power steering and answered questions about four-wheel drive. She emphasized, and simplified, the importance of oil changes: "Oil lubricates your engine. When you change it, [your car] runs a lot smoother because you have fresh lubrication in there, and the engine likes that." The free monthly workshops fill up within a couple of hours of being posted on the Girls Auto Clinic website. And as word of the workshops began to spread, Banks found herself inundated with requests to host them in different cities. "Women are eager to learn more about their cars," Banks said. 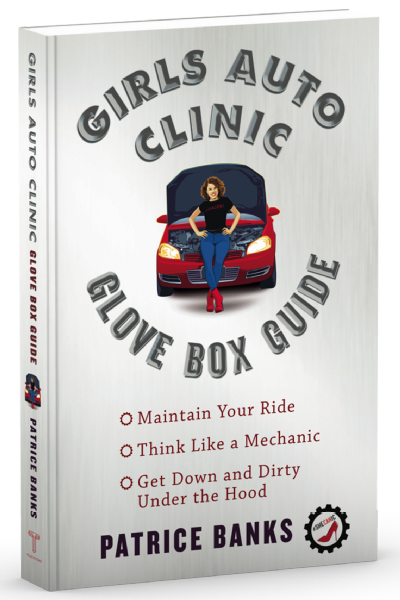 To reach more women eager to learn about their cars in a simple and effective way, Banks published a book, "Girls Auto Clinic Glove Box Guide," on auto maintenance, repairs and roadside emergencies. She's currently touring to promote the book, published with Simon & Schuster. "I thought it would be great to put it in a book so people who couldn't go to workshops could access the information, or so if I couldn't do [a workshop], they would have access to what I teach," Banks said. Shanailan Allen, 32, of Philadelphia, attended the recent workshop because, she said, "I have a two-year goal: Keep all the money I can in my household and learn how to do certain things on my car." There is a greater mission beyond the lavender smells and feminine touches of Girls Auto Clinic. It's a place where women can be empowered and where Banks hopes to inspire more women to take an interest and make strides in the auto industry. Banks grew up in a small town just northwest of Philadelphia. Her family didn't own a car, and her mother did not know how to drive. Banks worked three jobs before she was 16 in order to purchase her first car. Patrice Banks wrote the book, literally, for women when it comes to auto maintenance, repairs and roadside emergencies. "I was the first person [in her family] to have a car growing up," Banks said. "When I turned 16, I bought a 1998 Chevy Cavalier that was brown on the inside and brown on the outside, and my grandpa taught me how to drive." For Banks, who said she grew up in an abusive household, the car was a symbol. "My car represented freedom, and my car represented a way for me to get out my circumstances, which were very rough growing up," she said. "My family wasn't empowered or educated, and I was the one that needed to get out and I became the exception to the rule. I always knew that there was something else out there for me, that I didn't belong there, and I always wanted more for myself and I was always doing more for myself." Her first career stop did not involve cars. She majored in materials engineering at Lehigh University, where she also competed on the recreational crew team. She graduated in 2002 and immediately went to work for DuPont as a materials engineer and manager. "I was good at math and science, but I really didn't know what an engineer was," she said. "What I did know is that I was good at solving problems." After working for nine years at DuPont, Banks said she felt a calling for something more meaningful. "When I turned 30, I realized I wanted to make a difference with women," she said. "So I started to blog about ideas that women had to pay men for help in typically, areas where we often feel powerless." She started surveying women in coffee shop lines, on Facebook, at work. Overwhelmingly, the response to her question, "What do you wish you knew how to fix?" was: "My car. I feel like I'm getting taken advantage of." Banks began looking for a female mechanic. She had little success. "I was surprised with how few women are auto technicians," Banks said. "I was naive, as a lot of women are, and most people are because it's not even something that you think about it. When I Googled female auto techs, the first thing that popped up were stock images of female mechanics, or highly sexualized images with women and cars." According to the U.S. Department of Labor's Bureau of Labor Statistics, women make up just 1.7 percent of automotive technicians and mechanics in 2016. The low numbers of women in the field -- and the cost of auto repairs -- bothered Banks so much that she decided to become an auto technician, attending Delaware Technical Community College while continuing to work full time. As she learned her new skills, Banks knew the only way to get women excited about their own cars was to provide a place that felt welcoming to them. She left DuPont in 2014 and started working for an auto repair shop in Philadelphia, initially for free. Banks also started up her series of workshops at that time and wrote "Glove Box Guide." Her success led to the opening of Girls Auto Clinic in January. Her shop employs three full-time female auto technicians and offers apprenticeships to women studying to be auto techs. Add in the stylists and nail techs at Clutch Beauty Bar, as well as her assistant and a receptionist, and Banks' business employs 10 women. "Girls Auto Clinic is not just educating women to be smart drivers, but we're also hiring women, giving them opportunities to work in the automotive industry so that they can be in positions of influence and power," Banks said. Part of the reason so few women work in the industry is because they're discouraged at a young age, Banks said. Her assistant, Stephanie Tarbous, had an interest in cars and expressed wanting to pursue a career in the industry as a little girl. "You're not going to have a good time in that field. You're probably going to have a lot of bad experiences," Tarbous, 25, recalled her father warning her. Tarbous derailed that dream, but by fortuitous circumstances met Banks and started working for her in March as an office assistant. "Banks paid for me to get my emissions inspector certification, and now I am contemplating going back to school to become an auto technician." Tarbous said. 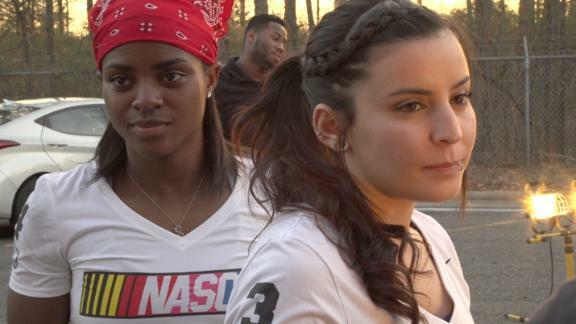 Along with being discouraged to work in the auto industry, girls are not exposed to cars the same way boys are, according to Ashley Parlett, a full-time assembly mechanic with Chip Ganassi Racing, which includes Jamie McMurray's Monster Energy NASCAR Cup Series cars. "Boys are given LEGOs at a young age and taught to build things. Girls are given Barbie dolls and told to play make-believe," Parlett said. After going to a dirt-track race when she was 11, Parlett knew she would work with cars one day. She begged her father to let her race, so he bought her a go-kart under one condition: "I had to learn how to fix and work on the go-kart myself," Parlett said. All the way through high school and into her early 20s, she tinkered away and developed a love for auto mechanics. "I was a decent driver, but I wrecked a lot, so I knew my future was limited in it without a big pocket," Parlett said. "But I had an equal if not bigger passion for working on cars." Ashley Parlett moved to Charlotte, North Carolina, at age 20 in hopes of landing a job as an auto mechanic. She's been in NASCAR for 13 years. To fuel that passion, Parlett decided at 20 to move from Maryland to Charlotte, North Carolina. 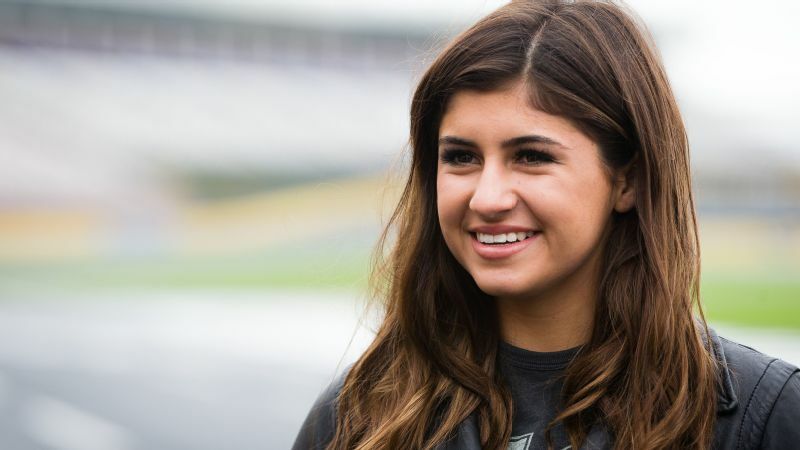 "I took a chance and literally in 24 hours decided I needed to move to be wherever would help me make a living as a mechanic on race cars," she said. "I moved to Charlotte -- no home, no plan, nowhere to go -- and just started knocking on doors to try to get a chance." Kelly Sutton, who raced Craftsman trucks at the time, gave Parlett a chance to work on her vehicles as an unpaid intern. Parlett started to wait tables for income and continued to work on cars for free. "When I did an apprenticeship at an engine shop, it was my first opportunity to see myself create things," Parlett said. 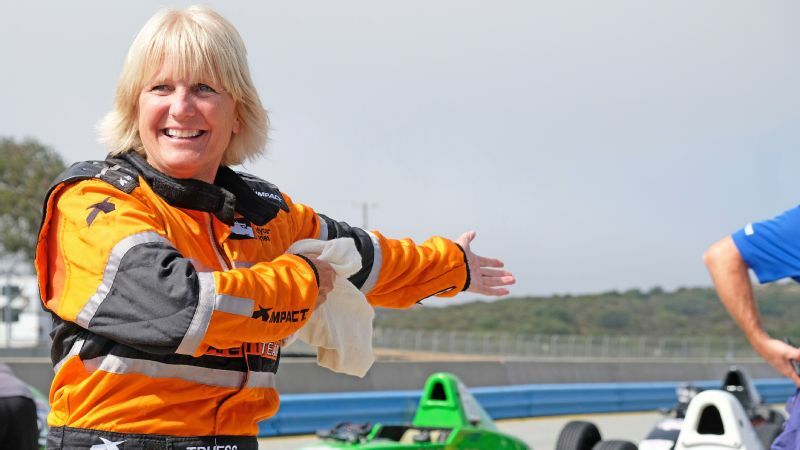 In 2007, she became a car chief -- responsible for getting the car set up to the crew chief's specifications --for a then-struggling Nationwide Series team. She quit in 2010 and spent time working for a brake company and doing social media for Speed TV. Parlett said it made her realize how much she missed being a mechanic, and returned as a car chief for K&N Pro Series East in 2013. Parlett, now 33, has since joined Chip Ganassi Racing and went from working full time in 2015 on McMurray's Chevrolet in the grueling Cup Series schedule to an assembly mechanic in the Xfinity Series and wrenching on Ganassi's famous sports cars, which doesn't require travel every weekend. Her first win as a mechanic came last year as Ganassi Racing's Ford won the GTE Pro Class in the 24 Hours of LeMans. Parlett is a rarity in professional auto racing, which has yet to see a woman working as a crew chief. Banks hopes to change that through her workshops at her garage, and through working with organizations such as the Girl Scouts. "When teaching the girls, it's just teaching them about their cars and to be proactive about car maintenance, not how to work on their cars," Banks said. "And honestly, there's a lot of girls that want to work on cars, and I don't usually have a problem finding girls that want to get into the industry. But I do think we [women] need to have more representation, and it helps when me or my auto techs go into these spaces and show these girls there's a space for them in this industry." Banks noted that whenever she teaches her workshops, a few of the young women will come up to her and say, "I am interested in working on cars, but my parents have told me no. But now you've inspired me to do it anyway." 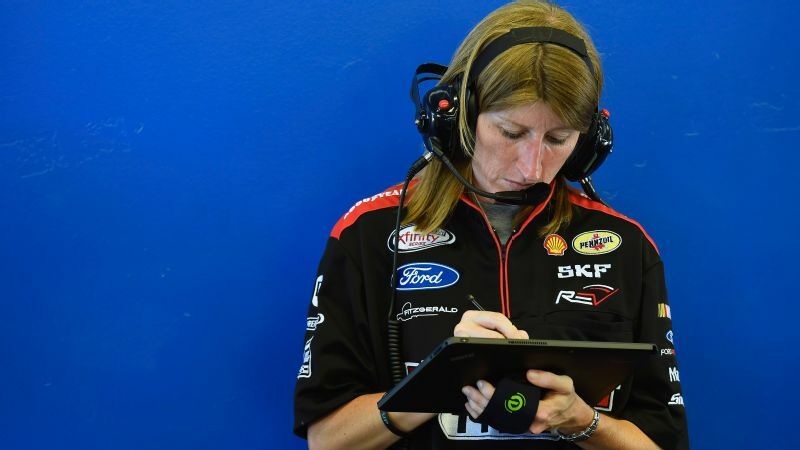 For Parlett, reaching the girls at a young age is key in growing representation of women in NASCAR, but so is making automotive technology a normal industry for girls to want to pursue. "We need to make it attainable but also seem not out of the ordinary," Parlett said. "I'm not normally one to be like, 'I'm a girl, I'm breaking down barriers.' I feel like it does more for women just to see me doing what I do and to see me without it being odd." Banks and Parlett note that being an auto mechanic isn't glamorous by any means. They're often covered in grease, and the work is laborious. But both love what they do and are helping to encourage girls and women to get into the field. "I was the only girl in my auto class, and I was intimidated and scared and I didn't step up in the beginning," Banks said. "But I had to snap out of that and not be afraid to make mistakes. Have the courage to follow your dreams, because those people who doubt you don't matter."